Today’s Flash Back Friday comes from Episode 88, originally published in July 2012. Teaching basic reading, writing, and arithmetic has been systematically replaced with an agenda-based curriculum run by government organizations, shifting America’s educational system from one of learning facts and figures to changing values and beliefs, i.e. brainwashing. Join Jason Hartman and whistleblower Charlotte Iserbyt in this lively discussion about the dumbing down of America’s school children and college students. Listen at: www.HolisticSurvival.com. Charlotte explains 100-plus years of chronological history of educational reform, through the use of controversial, non-academic material, institutionalizing schools, and plans for a global economy, and how these reforms have led to American students scoring below the international average and being among the lowest of several participating nations in mathematics and science. Material collected over a 30 – 50-year period shows the irrefutable proof of deliberate and malicious intent to bring about behavioral changes in students, parents, and society for a collective mentality. Charlotte discusses the Pavlovian and Skinner animal training methods being employed today in America’s schools that has led to a socialist democracy, and which is disguised in many ways, such as Outcome-Based Education. 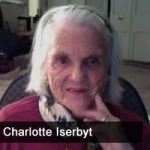 She also talks about how books are being phased completely out of schools, to be replaced with computers, which further emphasizes this global economic system and collectivism. Charlotte encourages parents to become more knowledgeable and informed of what their children are being taught in today’s schools.